Sydney roofs see some of the toughest weather conditions in the country from summer storms to frosty winters. If you have a leaking roof, a roof that has seen better days or are looking for a way to bring out the most in your Sydney property, make your first call to the team at Tandem Trades. With over 25 years' experience we are licensed and licensed and experienced roof repairs and metal re-roofing that match quality workmanship with a great prices. We specialise in Colorbond and Zincalume metal roofing and flashings. As expert roof repair contractors in Sydney, we proudly serve all of our residential, commercial and industrial customers throughout the greater Sydney region. Whether your roof suffers from a slow leak or has simply disappeared in the last summer storm, no job is too small or too large for the metal roof repair experts from Tandem Trades. Combining modern materials with the know-how and experience that you only get from a quarter-century in the industry, Tandem Trades is the first call for smart home and business owners that know the importance of having their metal/tile roof repairs done right the first time. We are very experienced in insurance work. We offer an obligation free quote for all metal/tile roof repair projects, no matter their size and we look forward to hearing from you to discuss your roof repair needs for your Sydney property. 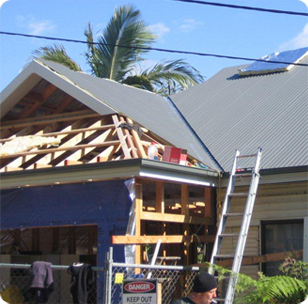 We provide residential, commercial and industrial roof repair solutions throughout the greater Sydney area including Sutherland Shire, St George, Inner West and the Eastern Suburbs Sydney.